different meaning. So it is the case with the Celtic Motherhood Knot that is a demonstration of the strong bond which exists between a mother and child while merging and including their heritage and faith. The basis of the Celtic Motherhood Knot is an inconspicuous Trinity knot, a design in itself that has a maternal meaning. In Christianity the Trinity knot represents the Holy Trinity by depicting God the Father, God the Son and God the Holy Spirit as one; however prior to Christianity reaching Ireland, this same knot was known as a triple goddess that represented the three stages of womanhood. The number three was powerful in itself to the pagan Celts and the three stages of the triple goddess knot are virgin, mother and wise crone. 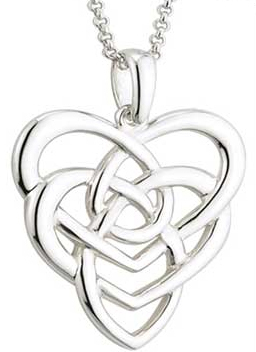 Two intertwined hearts, with one above the other are combined into this design that forms the Celtic motherhood knot. The continuous entanglement of the Celtic mother's knot depicts the parent and child in a loving embrace. The Irish Gift House is proud to offer a spectacular selection of Celtic knot necklaces but with Mother's Day just around the corner we are particularly happy to feature the Celtic Motherhood Knot necklace that is made for us in Ireland by Solvar Jewelry. Like all our sterling silver Celtic necklaces this special design for Irish mothers has been hallmarked by Irish Assay Office at Dublin Castle in Ireland and it is also part of the Fáilte Collection that is enhanced with both a heavier pendant and chain.